The MIT provided a grant to the Red Meat Abattoir Association (RMAA) for training. The RMAA developed a number of qualifications for the red meat industry. Learnerships are the route to follow in order for a learner to achieve the qualification. A learnership takes 1 year to complete and combines theoretical and practical work experience. A person who successfully completes a learnership acquires a qualification that signifies occupational competence and is nationally recognized. 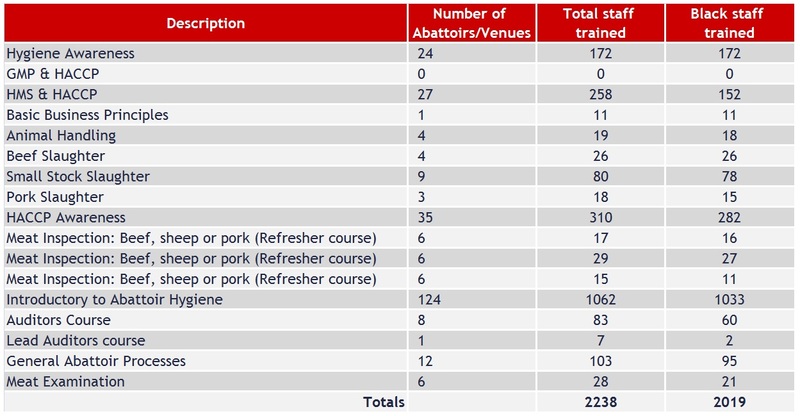 in addition to the formal training and other services provided to abattoirs.